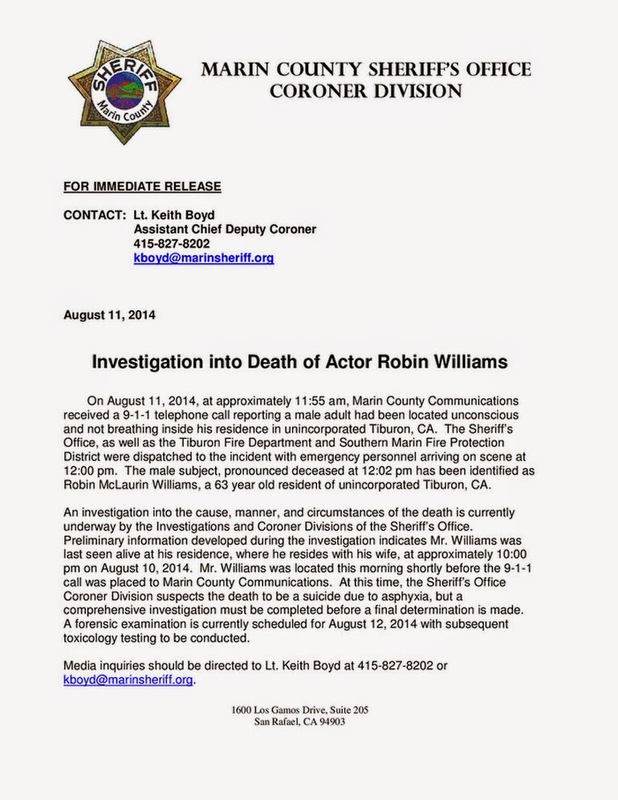 Ocar-winning actor and comic Robin Williams died Monday at 63 of an apparent suicide, the Marin County Sheriff's Office confirmed. Around 11:55 a.m. Monday, sheriff's officials said, a 911 call came in about a man who was unresponsive in his home in Tiburon. He was pronounced dead at the scene. Williams "has been battling severe depression of late," his publicist Mara Buxbaum said. "This is a tragic and sudden loss. The family respectfully asks for their privacy as they grieve during this very difficult time." Dubbed “the funniest man alive” by Entertainment Weekly in 1997, Williams brought audiences hours of laughter, putting his imaginative spin on characters in film and television. He was lauded for his serious roles as well, winning a best supporting actor Oscar for his performance as Sean Maguire, the therapist who counsels Matt Damon’s math genius in “Good Will Hunting” (1997), and receiving nominations for “The Fisher King” (1991), “Dead Poets Society” (1989) and “Good Morning, Vietnam” (1987). Williams was known for being open about his problems with cocaine and alcohol over the years. The actor spent time on a Hazelden campus in Oregon in 2006. He later explained that drinking had gradually become a problem again after 20 years of sobriety. "You're standing at a precipice and you look down, there's a voice and it's a little quiet voice that goes, 'Jump,'" the "Mrs. Doubtfire" star told ABC News in October of that year. "The same voice that goes, 'Just one.' … And the idea of just one for someone who has no tolerance for it, that's not the possibility." This summer, he returned to rehab to "fine-tune" his sobriety. Born in Chicago in 1951, Williams became one of only two students accepted into John Houseman’s prestigious acting program at Juilliard, the other being Christopher Reeve, who became a lifelong friend. Williams gained fame as Mork, the bizarre, suspenders-sporting alien on the sitcom “Mork & Mindy,” a spinoff from “Happy Days.” Williams departed from the script so often that producers intentionally left blank moments on page for Williams to have space to indulge his ad-libbing genius. Williams' last post on Twitter was about his daughter. Other celebrities turned to the social media site to mourn him. "I could not be more stunned by the loss of Robin Williams, mensch, great talent, acting partner, genuine soul," fellow actor-comedian Steve Martin said on Twitter. "Robin Williams was like no other," actor and director Henry Winkler said. "To watch him create on the spot was a privilege to behold.. Robin you are an angel now !!! REST IN PEACE"
"Robin Williams, Peace be Still, Peace be Still," actress Pam Grier posted. "Wow just landed in Atlanta and read about robin Williams. Devastating. One of my favorites #rip," tweeted Doug Ellin, creator of the TV series "Entourage."